These were just a cute little thing I spotted while grocery shopping last week. Can I not shop for groceries without coming home with a polish or a lipgloss? Guess not! 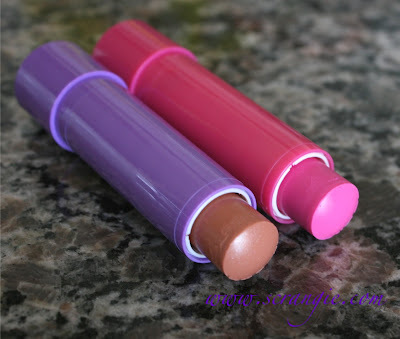 :D It was the scents and the bright packaging that attracted me to these. Couldn't resist. 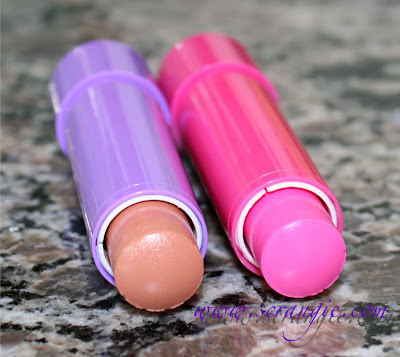 They're called Maybelline Baby Lips and they're a "clinical strength" (that makes it sound like a deodorant or something) eight-hour moisture balm with SPF20. The ones I got are Pink Punch and Peach Kiss. Cute, colorful tubes with big, graffiti-like bubble lettering. Adorable. 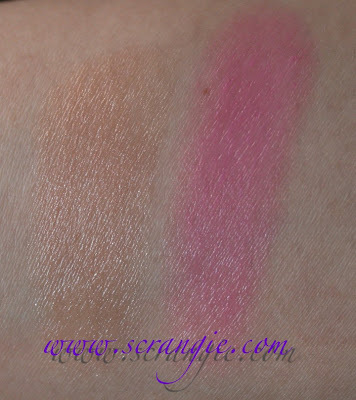 Peach Kiss is a sheer, slightly brown peach with silvery shimmer. 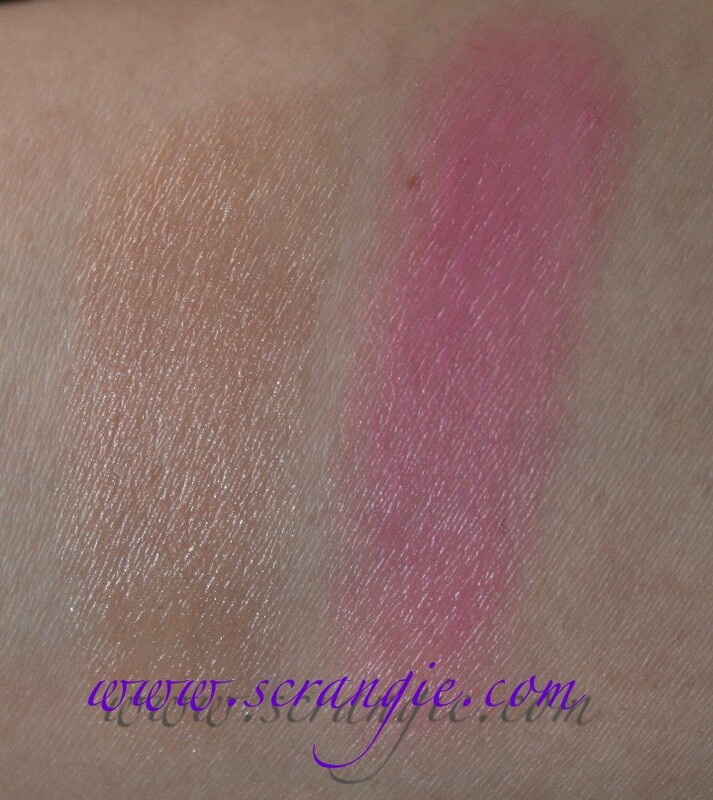 Pink Punch is a sheer hot pink tint with no shimmer. Applied heavily. Peach Kiss on the left, Pink Punch on the right. I've used these for enough time to formulate an opinion, so here's a quick rundown of my experience. Very moisturizing! Makes my lips feel comfortable even after they've worn away. Nicely scented. I prefer the fruit punch scent of Pink Punch over the weaker peach scent of Peach Kiss. 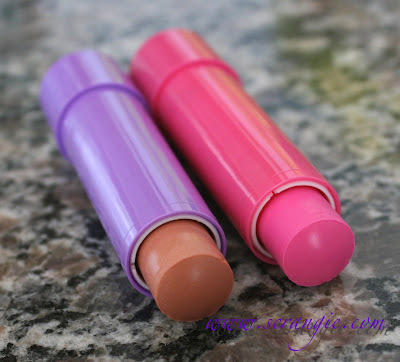 Cute, functional packaging; clear lid with a twist-up balm allows you to see the color. Inexpensive; these were around $3, though I don't recall the exact dollar amount. Comes in a variety of scents and colors including clear (possibly unscented) and a clear cooling version. Has pretty high SPF, bonus. Adds a good amount of color for a balm. The flavor of the SPF ingredients is VERY STRONG. Wish it wasn't so prominent. I generally don't mind the sunscreen flavor, but it overpowers the fruit scent in these. Peach Kiss is hideous on me. I have fairly reddish pigmented lips and so the sheer dirty peach shimmer just looks... gross. Would not recommend if you have similar coloration. 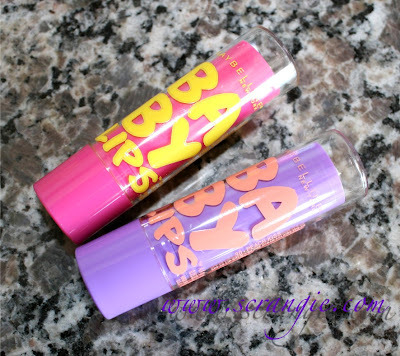 The name 'Baby Lips' creeps me out. Overall, I like these. 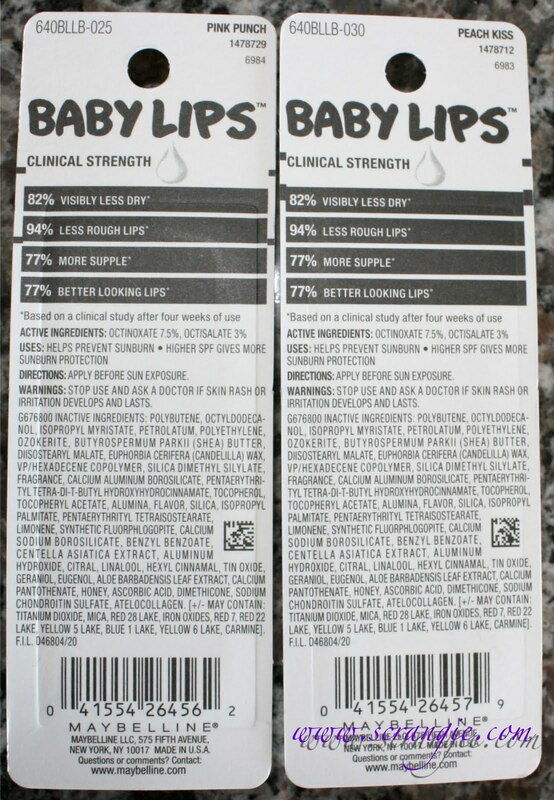 They're nice and moisturizing, though I don't know about the eight hour claim or the "clinical strength" thing. The peach looks awful on me, but I'd totally try another color if they go on sale. I love that they have SPF, color, moisturization and flavor/scent all in one inexpensive product, so I'll definitely be keeping at least one in my purse at all times. I just love the package! hahhaha I wish here in Brazil we could have them so I could try it.... Maybe it comes... but certainly it will take very long to arrive! I cannot tolerate SPF flavor, ugh! All I can think is "BABY FISH MOUTH! BABY FISH MOUTH!" from When Harry met Sally. 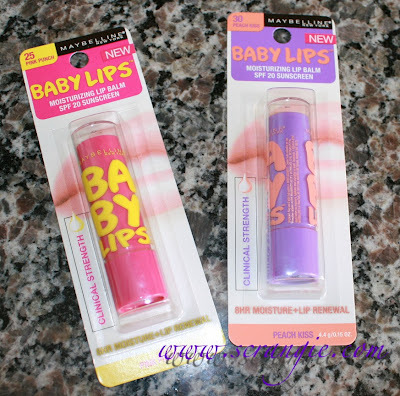 Maybelline needs to bring back Kissing Coolers! I wish Scrangie could make a post on this:) I bet you remember these Scrangie! Even though it doesn't have sunscreen, NOTHING can top Dr Pepper Lip Smackers. The Cherry Coke one is also good, but it doesn't have a nice reddish tint like the DP one. And the Sprite one is like SHEER WHITE. CRAZY. Yes, I'm addicted to these. Chapstick is full of chemicals as well. But yes exfoliation and vasoline works great. Just doesn't last more than 30 minutes. 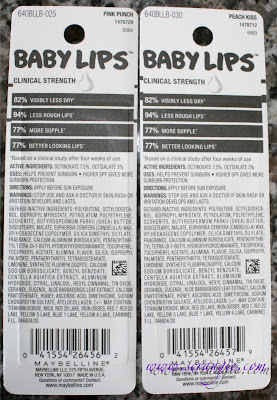 Chapstick is full of chemicals as well. Vasoline works fine just doesn't last long.